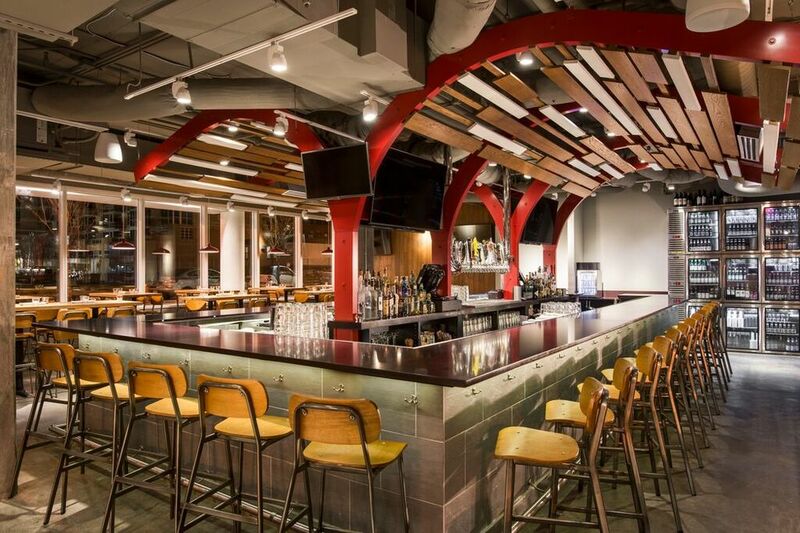 GrizForm Design Architects created a new kind of sports bar for Bonchon’s first D.C. location near Nationals Park, the Washington Nationals’ home in Navy Yard. The firm’s concept for the 5,300-square-foot space blends the brand’s sleek aesthetic with casual textures and materials, creating a relaxed environment for guests to sit back, watch some baseball, and enjoy Bonchon’s signature fried chicken. The 200-seat eatery features a large sports bar, and a spacious dining area where guests can enjoy menu items like bulgogi, pork buns, and a selection of Asian and American craft beer. The brand’s color palette of red and black is blended with a mix of wood tones, bringing warmth to the interior.